Biking to work is a good thing. And not just this week. This week is National Bike to Work Week, a good time to remind yourself why biking to work is an excellent alternative to driving. For many people, distance and safety make biking to work challenging, maybe even impossible. But you probably can replace at least some car trips with biking or walking. Infographic: Bike To Work Week: Bike Lanes Aren’t Just For Show | USA TODAY College. Earlier this week I was talking to my Health & Behavior Change class about the leading causes of death, most of which are chronic diseases that are caused, in large part, by health-related behaviors. In our discussion the students expressed some surprise at what diseases really kill the most Americans each year. It turns out that much of what we perceive to be the biggest threats to our health come from what we know is based on fund raising and PR efforts from organizations that represent specific diseases. The recent Ice Bucket Challenge to raise money for ALS is one example. No question, this—and others like it—are worthy causes. But it does distort our perception of the health problems we should be most concerned with, and the things we can do to prevent or delay these conditions. 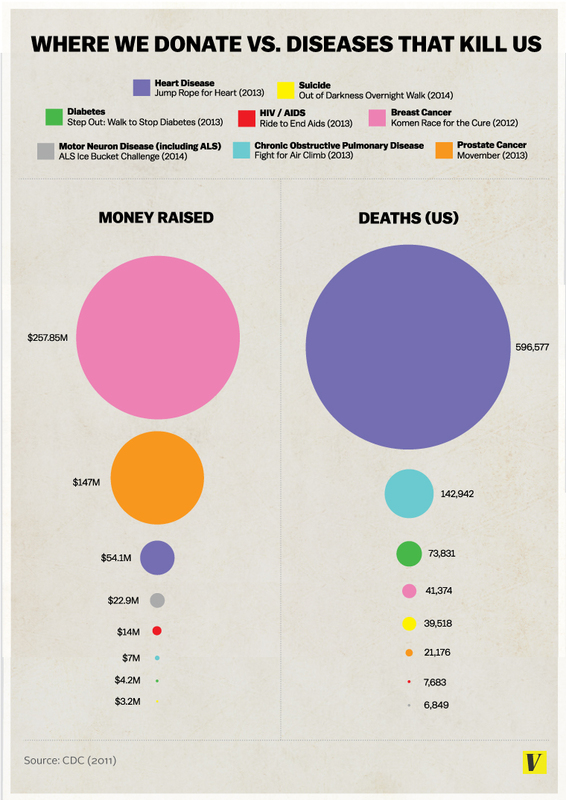 This infographic, from VOX, makes clear the difference between where we donate money and the diseases that are most likely to kill us. That’s not to say that we shouldn’t raise money to support ALS research. But we should pay attention, through fundraising and personal interest, to the diseases that are most likely to impair our health. Posted on August 28, 2014 in Infographics! 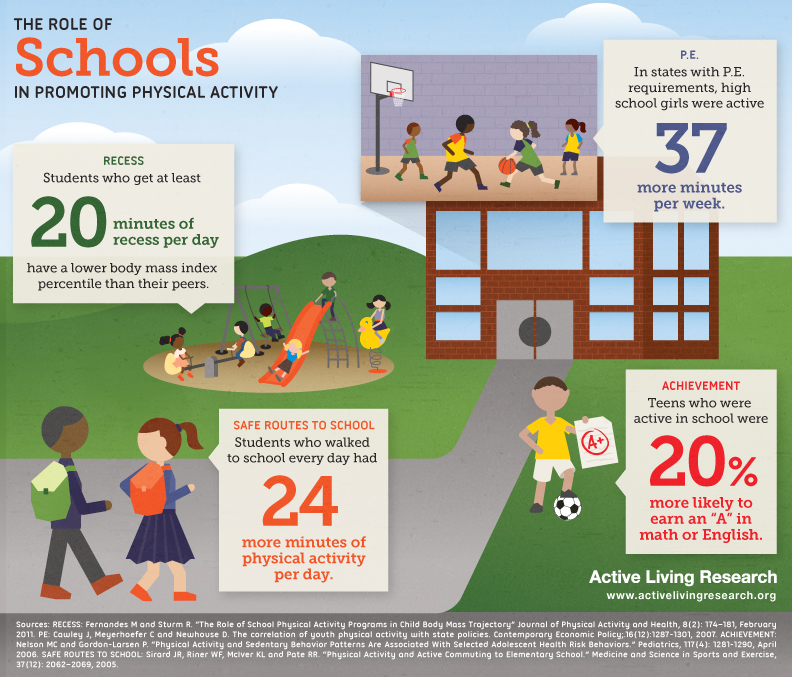 This week I came across two infographics explaining the benefits of including physical activity in the school day and ways kids can be active at school. Having opportunities to be active throughout the day benefits children in many ways, from improving their health, helping them maintain a healthy weight, and promoting learning. In fact, physical activity through recess, structured PE class, and other unstructured activities is absent at many schools. This represents a missed opportunity to teach children about the importance of being active. According to these infographics, though, engineering activity into the school doesn’t have to be difficult. And including physical activity in the school day makes children believe it is important (which it is) and helps develop habits that will last into adulthood. Now if we could just do something about the quality of school lunches! Good advice for college students. And everyone else. This is good advice for the rest of us, too. Replace dorm room with living room and cafeteria with kitchen and you have a simple and effective way to improve your health. By the way, studies of weight gain during college show that it isn’t really the Freshman 15. Research shows it’s more like the Freshman 4.6. But that doesn’t have the same impact, does it? Why you should get up out of your office chair right now. It’s Friday afternoon. Between your time spent at home and at work, you have probably been sitting for much of the week. It’s time to get up out of your chair right now! Since it is Friday afternoon, why not head down to your local pedal-powered pub for happy hour!